Anything 'themed' means good night guaranteed. Doesn't matter if it's a themed party or retro burger joint with an old-school jukebox, a good theme makes everything better. Bars included. 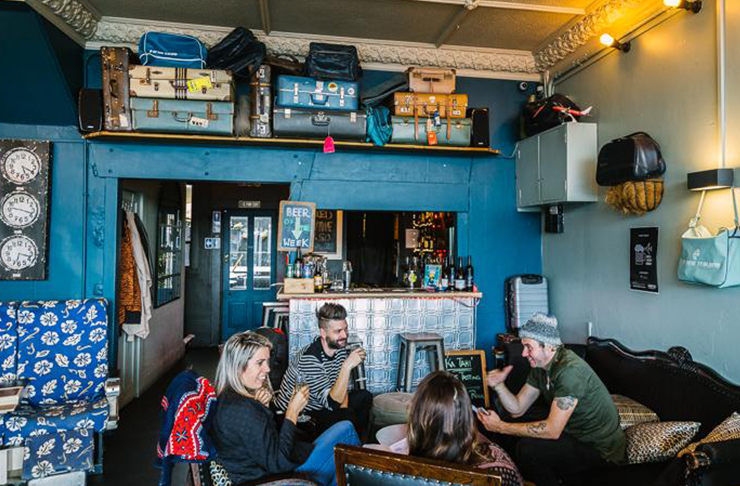 Auckland is home to an endless range of bars. Some make you feel fancy, some make you feel at home, but there are a few special ones—and these are the kickass theme bars. Here's a list of our favourites in Auckland. Opened by ex-flight attendants, Flight 605 is all about the golden era of flight. You know, that Catch Me If You Can, pilot-themed glam. The space is decked out with bits and bobs from the past, like funky plane graphics, old school suitcases and airline seats for punters. Flight 605 also encourages you to get interactive—they've got flight attendant gear you can actually wear (after a few cocktails, anyway). Swanky, artsy, retro and quirky are just a few words to explain Housebar, located in Hotel DeBrett. They serve some of the best cocktails in town. This place is an intimate bar—it’s really just you and the bartender, and this gives you a chance to share all your secrets like they do in the movies. The eclectic mix of quirky furniture, along with antique gramophones and quiet setting, throws us back to Gatsby days. No other bar in Auckland can provide a vibe quite like Housebar. Good one for out-of-towners. If hidden gem was a theme (which we’re claiming it is), Deadshot in Ponsonby is where to go. The atmosphere goes beyond ‘dimly lit’ and reaches the point where it’s so dark that you need to get real up-close and personal to see each other's faces. The service is on point too, and the guys are always happy to sit down and chat through the latest cocktails. Sit back, relax and put your trust in the bartenders to make you a customised bevvy (which we can guarantee you’ll love). Soak in the underground vibes Deadshot has to offer. It doesn't get much cooler than this in Auckland. Get a little taste of Oktoberfest at The Occidental Belgian Beer Café. The Occidental has a menu built for pairing with pints of beer. Their big mussel pots, Belgian sausages and chicken croquettes are the perfect sidekick to our fave drink from The Occidental, Belle-Vue-Kriek. It’s a cherry beer, and if you haven’t experienced one of these yet, get amongst it. The bar fit-out is modest and humble, with rustic wooden floors and warm lighting. Kinda makes you feel like you’re in a local pub in Germany. In all honesty, we’re not sure what Gogo Music Café was going for, but we think that’s the beauty of it. The décor is Western-inspired, with cowboy hats, ropes and dark wooden floors and furniture. You’d think that would mean Gogo is all about the classic Western grub, but you'd be wrong. These guys cook up skewers of different cuts of meat like chicken liver and kidneys, spicy chicken casseroles, hand-pulled noodles and dumplings. The go-to beverage at Gogo is the famous Chinese beer, Tsingtao. It’s light, refreshing and completes the Gogo experience. To top it all off, they even have an open karaoke stage. Get amongst the Japanese drinking culture at this underground sake bar, tucked away on Queen Street. Although it’s just down the stairs from the busiest street of Auckland city, Kura makes you feel like you’re drinking at a local bar in the streets of Osaka. Kura doesn’t just have a traditional Japanese sake bar theme—they freaking embody it, with an all-Japanese staff serving up traditional stuff like yakitori skewers, fresh sashimi and the crispiest tempura. The waiters and waitresses explain to you which Japanese beer, spirit or wine will best suit your order, and the whole thing is bloody delicious. Highly recommend. For whatever reason, the banter is always better in Irish bars. Must be all that Guinness. And that's defs true at Florrie McGreal’s in Takapuna. This place is everything you want in an Irish pub and more. The atmosphere is in informal, but that’s why we love it. The décor is typical Irish, so you’ll see a lot of green, and the menu stays true to the pub's Irish roots. Cheese fondues, pies, bangers and mash and mushy peas, yes please. There’s also a gaming room out back where you can test the luck of the Irish and see if you can score anything from the slot machines. Get your Mexican fiesta on at Marina Cantina in Half Moon Bay. 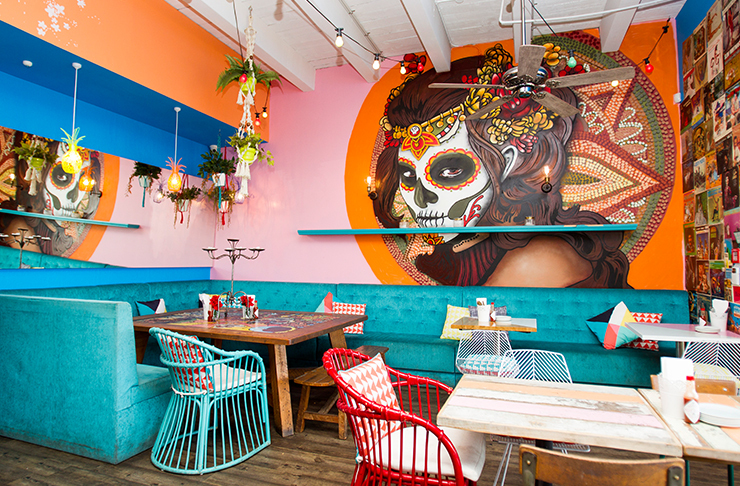 As soon as you walk in, you’ll see a beautiful painting inspired by the Day of the Dead (if you were in any doubt this place was a Mexican cantina...). Marina is colourful, vibrant and lively, and they don’t fool around when it comes to food and drinks. The menu here is authentic Mexican: guac, ceviche, quesadillas and churros, what more could you ask for? You can’t leave a Mexican bar without some margaritas in your system, either. Blended, shaken or stirred, they all taste 10/10. Smack bang on the trendiest street in Auckland, Coco's Cantina is serving up homely Italian dishes that'll make you feel like you're dining with a Bologna Nonna. From the white and red checkered tablecloths to help-yourself parmesan cheese, Coco's Cantina has become a crowd favourite amongst Aucklanders for its warm and welcoming vibe. Head on over to Coco's during their happy hour (5pm - 7pm) where you can get a glass of bubbly prosecco for just $7 and a big bowl of comforting pasta for $13. Score.